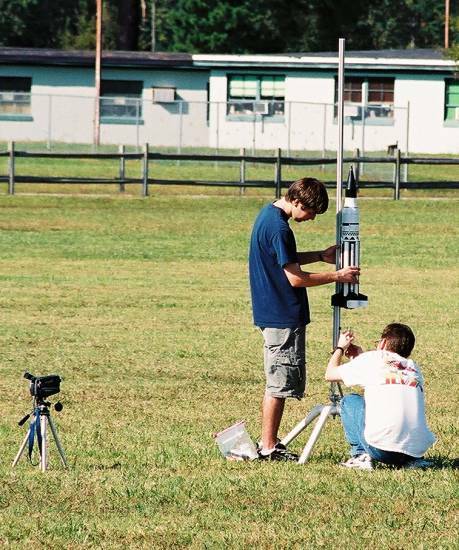 This series of web pages document the Meatball Rocketry Team’s SA-5 model project from its inception through its first place showing in Team Division at NARAM-50 in 2008. It began in the Spring of 2003 (during my Peanut Scale Saturn I project) with the design and construction of a simplified sport model. 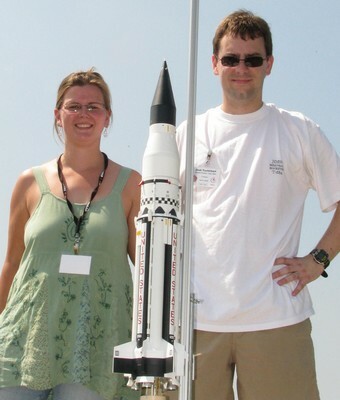 This sport model, what I call the “painted boilerplate”, became the testbed for both the PVC Spider R&D project and the eventual 2008 competition version of the model. After the initial four flights of the boilerplate, the design and building process for the competition model took much longer than intended due to several complicating factors, such as the vast number of components involved, the larger-than-usual scale of the model, weight factors, novel construction techniques (e.g. bolt-together assembly), and being a hard-to-satisfy designer (me). The majority of the time spent on the project involved thinking, sketching (and rethinking and re-sketching), and lots of CAD work. Two desperate attempts to finish the project for NARAMs in 2004 and 2005 were unsuccessful, but fortunately I had two very good and patient teammates who kept encouraging me through to completion. While there are obvious visual similarities between the original “painted boilerplate” and the final 2008 competition model, the differences in design and finishing are many. For specifics on the 2008 competition model, see project pages 3 and 4. The following text primarily discusses design and construction as it pertains to the earliest model as built and flown in 2003-2004, with little reference to the 2008 bird. I wanted to build the SA-5 in a scale that would be noticeably larger than the usual scales of 1:100 and 1:70 and have plenty of room for clustering. I was able to come up with a combination of two standard tubes that worked out almost perfectly for 1:59 scale. The rest would have to be rolled from scratch. The S-IV body was constructed using a BT-100 (3.744″ dia.) purchased from Kosrox, while the scale Instrument Unit used a BT-80 (2.6″ dia.). The Aft Skirt was rolled from a section of 1/64″ plywood (thanks to James Duffy and John Pursley for this technique). The tank tubes were custom wound around a modified copper tube using gummed paper tape and were evenly spaced around a BT-60 core/stuffer tube using resin star-shaped rings. The various tapered sections were cardstock reinforced with CA. The fins, nose tip, and various details (many were omitted for this model) were cast from polyurethane resin. Cluster? Yeah, we gotta cluster that thing! For the initial model design, I decided to utilize an 8-motor cluster, mimicking the cluster concept of the real Saturn I’s in hopes of earning some ‘mission points’ during competitive flight. 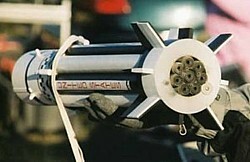 The need for safe and reliable ignition of all eight motors led to the development of the PVC Spider device. The peculiar non-scale radial arrangement of the motor mount tubes in the first boilerplate model (see lefthand photo) was chosen at first due to certain logistical concerns with the Spider. This design was changed in subsequent models to reflect a more scale-like arrangement of four “inboard” motors. The initial four flights were single stage only. 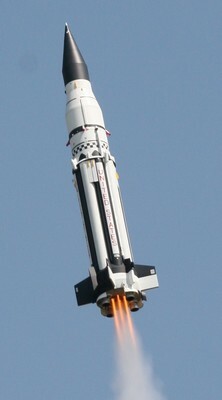 Scale-like simulation of S-IV stage ignition was not attempted until the fifth flight (see Saturn page 2) as part of the testing for the competition model. Coincidentally, this follows the real Saturn I program in which the first four flights (SA-1 through SA-4) had live 1st stages only. It was not until the SA-5 flight that a live upperstage was added. 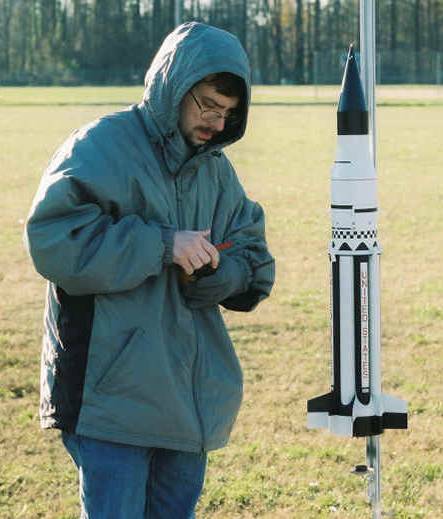 Deciding on a proper balance point for the original test model was particularly difficult since the standard rocket CP/CG relationship of 1 caliber (for this model, that means at least 4.36″ between the CP and CG) causes over-stability in such shorter, fatter models as the Saturn I–a condition that (coupled with the heavy model’s relatively slow liftoff) will possibly lead to excessive weathercocking during powered flight. Therefore, I used RockSim version 6.0 to calculate an approximate location of the Center of Pressure, inputting an assumed solid tube in place of the eight tank tubes (you can get the latest version of RockSim from Apogee Components). The resulting theoretical (ideal) CG location was about 2.05″ forward of the CP or 3.28″ aft of the tops of the tank tubes (see righthand drawing). This CG location was used in all the single-stage flights as well as the first 2-stage flight and the final NARAM-50 competition flight. 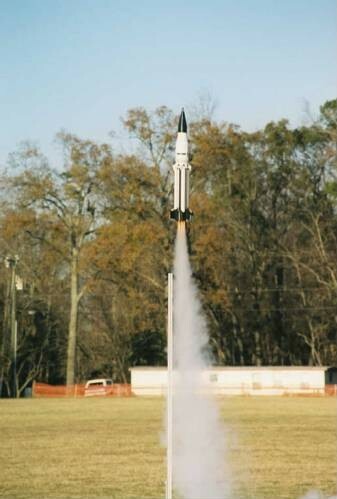 This required a fair amount of clay/lead weight ballast in the nose cone for the single-stage model, although less for the 2-stage version, due to the extra weight of the upperstage motor and RC-gear already in the model’s S-IV stage/payload sections. The original “painted boilerplate” flew on 8 C6 motors (32 oz total model liftoff weight) to an altitude between approximately 400-500 ft. Two of the motors were C6-5’s, providing redundant ejection charges for the parachutes. The remaining motors were C6-0’s; the propellant ‘blow-thru’ of each was vented out of the rear of the motor mount. The model weighed 32 oz. with motors and recovery system installed. The flight was 100% successful, and was the first live flight test of my PVC Spider prototype. The next three flights were nearly identical in terms of performance, inspiring me with confidence in model stability and design to begin work on the competition version of the Saturn. 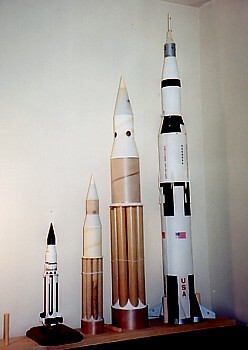 Gallery Below: The SA-5 in three scales (1:165, 1:100, 1:59) as compared with the 1:100 scale Estes Saturn V. The largest Saturn I shown is the test model. Note that there are many surface details (conduits, etc.) that have been left out. 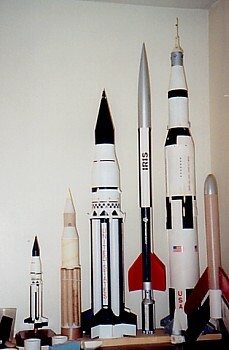 The other two models are Jess’s 1:7.3 scale Iris and (to the far right) a BT-60-based (and lengthened) Mosquito upscale. 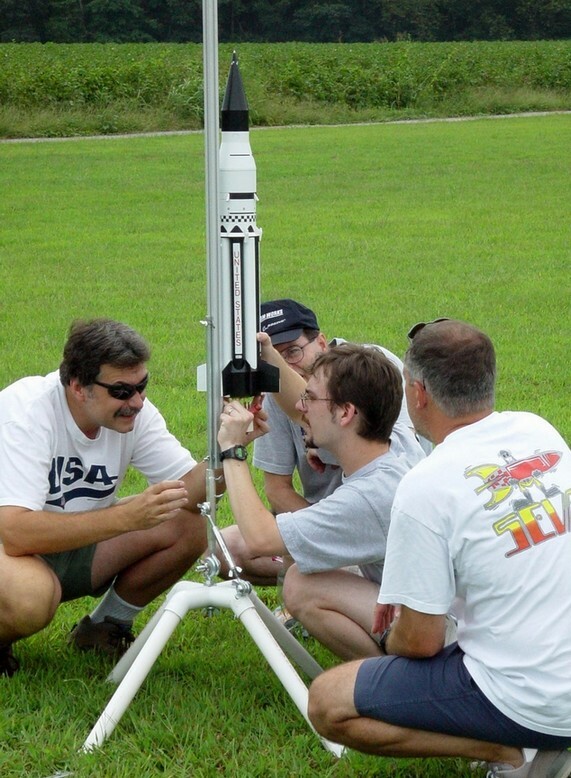 Additional photos to the right show the model during prep or launch of different single-stage boilerplate flights in 2003 (courtesy of Eric Fadely).